We've been telling you for a while that the Texan-built Hennessey Venom GT is an obscenely powerful, giant-slaying hypercar that will send your Bugatti Veyron crying back to Volkswagen with its tail between its legs. This is the Lotus-Texan frankenrocket with the 1,224 horsepower 7.0-liter twin-turbo V8, in case you forgot. Now, there's proof of its insanity — and it's proof of the numerical kind, which we car enthusiasts love most. 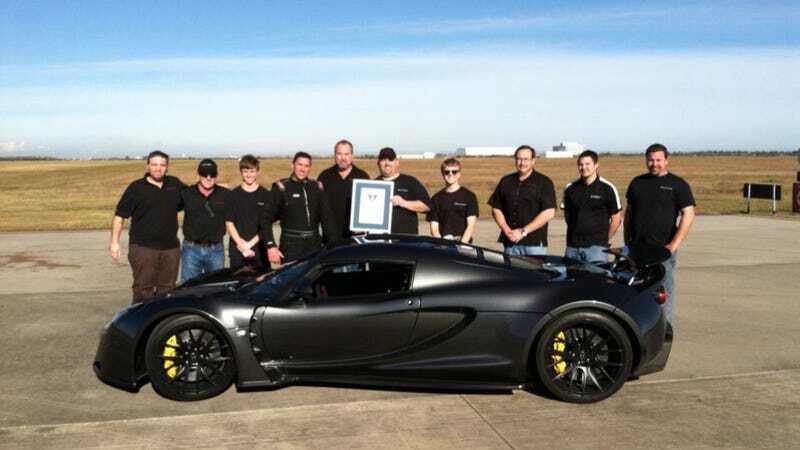 Matt Farah over at The Smoking Tire has reported that the Venom just accomplished a record-breaking run from zero to 300 kph (that's 186 miles an hour to us Yanks and Brits) in a mind-boggling 13.63 seconds. He said the run was observed by Guinness World Record folks. Farah has been out there all day with the nutjobs at Hennessey and a crew from Drive, sampling their various wares, and now he's about to take a spin in the Venom GT himself. If he survies they're planning to use the footage on a future episode of "Tuned."